Dust off your trainers and get set for group jogging sessions in West Oxfordshire led by a qualified instructor to help you on the road to getting fitter and healthier. A new round of 8-week ‘Just Jog’ sessions are being rolled out after Easter in Carterton, Eynsham and Witney for beginners. With nutritional advice, help and support provided, the sessions are aimed at those who have no, or very little, previous experience of jogging. Intermediate sessions will also be available for those who have some experience and would like to improve their pace and skills. Organisers are also looking to set up a group in Chipping Norton and would like interested local residents to get in touch (contact details bellows). The sessions will be led by instructor Lisa Betteridge as part of a community project run by West Oxfordshire District Council and its leisure contractor, GLL, which runs its leisure facilities. Lisa only started jogging three years ago herself as part of a mother-and-child exercise group after the birth of her son. 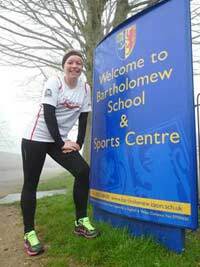 She went on to complete instructor training and is now preparing for her first London Marathon this year. The cost of the 8-week course is £24 for leisure centre members or £32 for non-members. Simply turn up and pay on the day. For more information, call 07595 090379 or email Catherine.Alexander@GLL.ORG.